Yu Darvish (ダルビッシュ 有, Darubisshu Yū, born 16 August 1986) is a Japanese professional baseball starting pitcher for the Chicago Cubs of Major League Baseball. Darvish previously played in MLB for the Texas Rangers and the Los Angeles Dodgers and in Nippon Professional Baseball for the Hokkaido Nippon-Ham Fighters. In international play, Darvish pitched in the 2008 Beijing Olympics and the 2009 World Baseball Classic as a member of the Japanese national team. He was considered by many to be the best pitcher in Japanese professional baseball prior to his arrival in Major League Baseball in 2012. In his first MLB season, Darvish finished third in the American League (AL) Rookie of the Year balloting. The next season, he finished second in the AL Cy Young Award vote as he led the Major Leagues in strikeouts with 277 and finished fourth in the AL in earned run average (ERA) at 2.83. On 6 April 2014, Darvish reached the 500 strikeout mark in fewer innings pitched than any starting pitcher in MLB history. Darvish was born Farid Yu Darvishsefat (ダルビッシュ・セファット・ファリード・有) in Habikino, Osaka, to a Japanese mother, Ikuyo and Iranian father, Farsad Darvishsefat. His father played for the Florida State University soccer team. His grandfather owned a travel agency in Iran and decided to send his son Farsad to the United States in 1977 to attend high school in Berkshire County, Massachusetts, where he also raced competitively in motocross. Darvish began playing baseball in second grade and led his team to the quarter-finals of the national tournament as well as a third-place finish in the international tournament as a member of the Habikino Boys. He was scouted by over 50 high schools while in junior high. He opted to attend Tohoku High School in northern Sendai, a noted baseball powerhouse that produced players such as former Seattle Mariners and Yokohama BayStars closer Kazuhiro Sasaki and former BayStars and Los Angeles Dodgers reliever Takashi Saito. Darvish became Tohoku High's ace pitcher by the fall of his first year (the equivalent of tenth grade in the United States) and led his team to four straight appearances in national tournaments held at Koshien Stadium in his junior and senior years, twice in the National High School Baseball Invitational Tournament held in the spring and twice in the National High School Baseball Championship in the summer. Darvish led his team to the finals of the 85th National High School Baseball Championship in the summer of 2003, but gave up four runs to Joso Gakuin High School (whose No. 3 hitter, second baseman Katsuhiko Saka, currently plays for the Hanshin Tigers), the Ibaraki champions, in a complete game loss. Darvish attracted national attention when he pitched a no-hitter against Kumamoto Technical High School in the first round of the 76th National High School Baseball Invitational Tournament as a senior on 26 March 2004. Though the team lost in the quarter-finals despite stellar outings by Darvish and sidearmer Kenji Makabe (currently with Honda Motor Company's industrial league team), many saw Darvish as the best high school pitcher in the country by that time. He pitched 12 games and put up a 7–3 record with 87 strikeouts in 92 innings pitched and a 1.47 ERA in his four national tournament appearances, and posted a 1.10 ERA for his high school career, striking out 375 in 332⅓ innings (67 appearances). Darvish was scouted extensively by Major League teams, such as the then Anaheim Angels and Atlanta Braves, even while in junior high. As he entered his senior year of high school, the Angels, Los Angeles Dodgers and New York Mets had all expressed interest in signing him, but Darvish's intent remained to play for a Japanese professional team instead. Darvish was considered one of the best high school pitchers in the 2004 NPB amateur draft along with Yokohama Senior High School right-hander Hideaki Wakui (later picked by the Seibu Lions) and Akita Municipal Akita Commercial High School right-hander Tsuyoshi Sato (Hiroshima Toyo Carp). While the Fighters, Carp, Chunichi Dragons, Fukuoka Daiei Hawks and Orix BlueWave all considered selecting Darvish with their first-round pick in the final months, the Fighters were one of the few teams that chose not to forgo the first round in exchange for signing a college or industrial league player prior to the draft. This enabled them to land Darvish with their first-round pick in 17 November draft, signing him to a base salary of 15 million yen, a signing bonus of 100 million yen and additional performance-based incentives (the equivalent of what a first-round college or industrial league player would normally receive) on 17 December. Darvish received further publicity when he was caught smoking in a pachinko parlor on an off-day during his first Spring training in 2005, despite not being old enough to legally smoke nor to gamble at the time. The incident prompted his high school to suspend him, and the Fighters to place him under probation for an indefinite period and order him to participate in community service. Despite his suspension, Darvish made his professional debut later that season, taking the mound in an interleague game against the Carp on 15 June. Though he gave up back-to-back solo home runs in the ninth, he pitched 8+ innings on those two runs alone and earned the win, becoming the 12th pitcher in NPB history to earn a win in one's professional debut as a rookie straight out of high school. He recorded his first complete game win on 6 August against the Lions and his first complete game shutout on 18 September, holding the Tohoku Rakuten Golden Eagles to just two hits and becoming only the 14th pitcher in NPB history to throw a complete game shutout as a rookie out of high school. He finished the season with a 5–5 record in 14 starts, throwing 94⅓ innings with an ERA of 3.53. Darvish had a breakout year in 2006, compiling a 12–5 record with 115 strikeouts and a 2.89 ERA. In particular, he went 10–0 after 30 May, playing a leading role in the Fighters' first Pacific League title since 1981 (his win streak lasted until 14 April of the following season, when it reached 12–0) and contributing to their first championship since 1961 in the Japan Series over the Dragons. Darvish was chosen to take the hill for the first game of each of the Pacific League playoffs, Japan Series, and the 2006 Asia Series (played between the champions of Japan, China, Taiwan, and South Korea at the end of the season). Darvish, then 20 years old, became the first pitcher to start a Japan Series game since 1987 while under the age of 21, and only the fifth pitcher in NPB history to win a Japan Series game at that age with his win in Game 5 of the series. He also won the Asia Series Most Valuable Player award. Darvish was named the Fighters' starter for their 2007 season opener, becoming only the fourth pitcher in franchise history (including the Fighters' years as the Senators and Flyers) to start a season opener within three years of graduating high school (the other three pitchers all started season openers as rookies). He struck out 14 over nine innings in a no-decision in his second start against the Lions on 30 March (the game ended a 2–2 tie in extra innings) and 14 again in a complete game win in his next start against the Fukuoka SoftBank Hawks on 7 April, becoming only the second pitcher in Japanese professional baseball history to strike out 14 or more batters in two consecutive starts. Darvish went on to post a 15–5 record with a 1.82 ERA (falling just 0.003 points short of the league lead, which went to Chiba Lotte Marines left-hander Yoshihisa Naruse) for the year, limiting hitters to a .174 batting average against and leading the league with 210 strikeouts. He led the Fighters to their second consecutive league title, winning both of his starts in the second round of the Climax Series (playoffs) against the Marines. Darvish took the mound in Game 1 of the Japan Series that followed on 27 October against the Dragons for the second straight year, pitching a 13-strikeout, complete game win in an intense pitchers' duel with then-Dragons ace Kenshin Kawakami and becoming only the third pitcher in Japan Series history to strike out 13 or more batters in a single game. With the Fighters down 3–1 and facing elimination, Darvish started Game 5 on 1 November and held the Dragons to one run over seven innings while striking out 11. However, the Fighters had no answer for opposing right-hander Daisuke Yamai and closer Hitoki Iwase, failing to get a single man on base and allowing the first perfect game in Japan Series history. (However, the game was not an official perfect game according to NPB regulations, which state that a perfect game must be thrown by a single pitcher.) The Dragons won the game 1–0, charging Darvish with the loss and becoming Japan Series champions. The 24 strikeouts that Darvish totaled in his two starts were the second-highest by any single pitcher in series history (and the highest in a series that went only five games). Darvish was presented with both his first career Eiji Sawamura Award (being the first to meet or exceed guidelines for the award in all seven categories in 14 years) and his first Most Valuable Player award following the season. He also won the Golden Glove and Best Nine awards that year. Darvish made his national team debut in the 2007 Asian Baseball Championship (which also functioned as the Asian qualifying tournament for the 2008 Beijing Olympics) against Chinese Taipei on 3 December 2007. Because Japanese law requires that a person holding dual citizenship choose a single nationality before their twenty-second birthday, Darvish had chosen to retain his Japanese citizenship so that he could play for the national team in the Olympics. On 22 December, Darvish re-signed with the Nippon Ham Fighters for 200 million yen plus payment at piece rates, up 128 million yen from 2006. At 21 years old, Darvish became the youngest player in Japanese baseball history to reach the 200 million yen mark. In 2008, Darvish was named the Fighters' starter in the season opener for the second consecutive year, pitching a complete game shutout in that very game (the Fighters won 1–0). Even as his team struggled in the opening months of the season, Darvish continued to rack up wins at a pace that exceeded his own in the previous season. As the year went on, he and Eagles ace Hisashi Iwakuma emerged as the league leaders in both wins and ERA. On 10 April, in their only match-up of the season, neither gave up a single hit through the first five innings. Iwakuma went the distance, throwing just 100 pitches and giving up just one run on three hits; yet Darvish topped this, throwing another complete game shutout on three hits and just 95 pitches in one of the best pitchers' duels of the season. While he did not pitch the way he had hoped in the Olympics, Darvish promptly put up a perfect 5–0 record with a 1.29 ERA and two complete games in the five starts upon returning to the Fighters, leading them to a playoff berth in a heated race against the Marines. While the Fighters failed to make the Japan Series, Darvish took the mound in two playoff games, giving up one run in a complete game win in one and pitching a complete game shutout in another. Although he lost out to Iwakuma (who put up an astonishing 21–4 record) in wins, he finished second in all three Triple Crown categories, finishing the season with a 16–4 record, 1.88 ERA and 208 strikeouts. (It was his second straight year putting up an ERA under 2.00, throwing more than 200 innings, and striking out over 200 hitters despite missing time due to the Olympics.) Regardless, the Sawamura Award was presented to Iwakuma, and Darvish became just the second pitcher to clear the guidelines in all seven categories to not win the award (Suguru Egawa was the first in 1982). 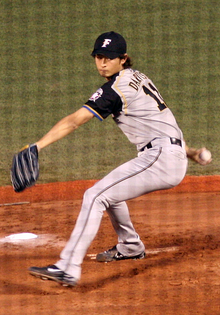 Darvish took the mound in Game 1 of the first round of the Climax Series against the Orix Buffaloes on 11 October, allowing nine hits but holding the team to one run while striking out 14 in a 4–1 complete game win. He started Game 2 of the second round against the Saitama Seibu Lions on 18 October and pitched a complete game shutout in a 5–0 win, but the Fighters lost the series 4–2 and fell short of their third straight appearance in the Japan Series. On 1 December, Darvish re-signed with the Nippon Ham Fighters for 270 million yen plus payment at piece rates, up 70 million yen from 2007. Darvish started the Fighters' season opener for the third straight year in 2009, taking the mound against the Eagles on 3 April in a matchup with the reigning Sawamura Award winner and World Baseball Classic teammate Hisashi Iwakuma. Darvish gave up three runs in the first inning but went the distance, allowing no runs from the second inning onward in a 121-pitch, complete game loss (Iwakuma held the Fighters to one run over six innings and was credited with the win). On 24 April, he struck out six straight and 11 overall en route to a four-hit, complete game shutout (his first of the season) over the Buffaloes, following it up by holding the Lions to one run and striking out 11 over nine innings in a no-decision in a match-up with fellow 22-year-old ace Hideaki Wakui on 1 May (the Fighters lost 2–1 in extra innings). On 22 August, Darvish was taken off the active roster for the first time in his career due to injury. The Fighters classified it as "shoulder fatigue", and the deactivation came after a career-worst start against the Fukuoka SoftBank Hawks, in which he went eight innings, but gave up six earned runs in a losing effort. He was reactivated on 13 September, but in his second start back a week later against the Orix Buffaloes, Darvish gave up a career-high seven walks in five innings, and two runs. Three days later he was deactivated again due to discomfort in his shoulder and a sore back. Darvish was activated again just in time for the 2009 Japan Series against the Central League champion Yomiuri Giants, and he pitched Game 2 on 1 November. He went six innings, giving up two runs on seven hits, and also striking out 7 Giants. He became the winning pitcher, and the team won 4–2. The Yomiuri Giants would go on and win the championship series 4 games to 1. After the Japan Series, It was revealed that Yu had stress fracture of the right hand forefinger. Darvish said he first experienced pain after practice on 28 October but kept it to himself. Also, he was unable to fully use the lower part of his body due to hip pains. Darvish was presented his second Most Valuable Player and Best Nine awards at the end of the season. He became only the third player to have won 2 MVP awards in their first five years in the NPB, joining Kazuhisa Inao and Ichiro Suzuki. However, he lost out on his second Sawamura Award to Saitama Seibu Lions ace Hideaki Wakui. On 9 December, Darvish re-signed with the Nippon Ham Fighters for 330 million yen, up 60 million yen from 2009. At 23, Darvish became the youngest player in Japanese baseball history to reach the 300 million yen mark, along with being the highest-paid pitcher in the Pacific League presently. Darvish's 2010 season was another strong individual performance, but he struggled to win as many games due to the Fighters troubles. The Fighters finished 74–67, but in fourth place. His opening day loss was reflective of his 2010 season; he pitched well but the team struggled. He began the 2010 season losing to the Fukuoka SoftBank Hawks on 20 March. Darvish allowed two early unearned runs on his way to a complete game loss (5 runs allowed, 3 earned runs) striking out 13. The Fighters began the season with a 5–14–1 stretch that was put them with their worst winning percentage in five years. They struggled in all phases of play, but Darvish continued to pitch well. Even at this low point, he was leading the league in strikeouts even as the rest of the rotation was 3–9. Darvish struck out at least 10 hitters in each of his first five starts. Darvish's 2010 season also was noticeable because speculation increased about his potential move (or posting) to Major League Baseball. Darvish was interviewed by The Associated Press where he announced his plans to review his options at the end of the season. He noted, "Right now, I'm just focused on helping my team win this season ... Once the season is over, I'll consider my future." The Associated Press noted that both his exposure to international play during the 2009 World Baseball Classic and recurring injuries both led him to consider leaving Japan. In addition to back problems he also missed a start in June with a sore right knee. Despite the injuries and potential distractions, Darvish pitched well down the stretch. His last three starts were all complete games and he struck out 35 hitters in those 27 innings. Darvish finished the season with only a 12–8 record, but with a 1.78 ERA. He led the league with 10 complete games, 222 strikeouts, a 1.01 WHIP. This was Darvish's fourth consecutive sub 2.00 ERA. On 18 October 2010, Darvish posted on his blog that he would be returning to the Fighters for the 2011 season. 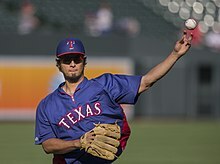 On 6 January 2011 Darvish agreed to a contract for the 2011 season that would make him the highest-paid player in Japan. His salary was 500 million Japanese Yen (which on 6 January converted to $6,065,490 US dollars). The 2011 Nippon Professional Baseball season was delayed by the Tohoku earthquake. Controversy emerged over when baseball should resume. Commissioner Ryozo Kato was criticized for comparing the resumption to the return of Major League Baseball ten days after the 9/11 terrorist attacks. Darvish was among the players who felt it was not appropriate to quickly return to baseball, "I am a baseball player and a human being as well. I cannot think about baseball alone as I normally do." Darvish took part in efforts to raise funds for the relief efforts and personally donated 50,000,000 Yen (about $620,000 USD) to the Japanese Red Cross. Eventually the teams agreed to play the full 144-game schedule, but the start of the season would be pushed back several weeks. The season began on 12 April 2011 and Darvish started against the Saitama Seibu Lions. He struggled, allowing seven runs in seven innings and taking the loss. This poor start would not reflect his overall performance. After that opening game, he would not allow more than three runs in any of his starts. Darvish would win his next eight starts and thirteen of his next fourteen decisions. Darvish would finish with his strongest all-around season, winning 18 games and featuring a career-low 1.44 ERA. He also led the league with 28 starts, 232 innings, 276 strikeouts and a 0.82 WHIP. He also featured remarkable control, walking only 36 batters. Despite his accomplishments, Darvish was not recognized with the best pitcher in Japan honor, the Sawamura Award. Three of the five-member committee voted to recognize Tohoku Rakuten Golden Eagles right-hander Masahiro Tanaka. Selection committee chief Masayuki Dobashi explained, "ERA is the best stat to evaluate pitchers ... Tanaka's ERA was a little better than that of Darvish. Tanaka also had more complete games than Darvish." Pitchers must qualify for the award by meeting seven criteria: 15 wins, a 2.50 ERA, 200 innings pitched, 10 complete games, 150 strikeouts, 25 appearances and a .600 winning percentage. Both Tanaka and Darvish met all the criteria. Tanaka noted, "I only had better numbers than him (Darvish) ... As a pitcher, I'm nowhere near his caliber." The Nippon Ham Fighters were eliminated in the first round of the Pacific League playoffs, losing both games to the Saitama Seibu Lions. Darvish started game one of the series, going seven innings and allowing only one run on four hits, while striking out nine. After Darvish departed, Seibu scored one run in the 9th inning to send the game to extra innings and added three more to win the game in the 11th inning. After being eliminated, speculation again increased about Darvish being posted to Major League Baseball. His pending divorce allegedly complicated this situation. Speculation centered on his wife's potential claims to a share of a new contract with an American team. 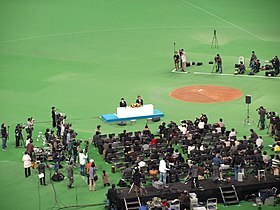 In press conference at Sapporo Dome on January 24, 2012, Darvish told more than 10,000 Fighters' fans why he decided to make a move to Major League Baseball. Darvish was posted to Major League Baseball prior to the 2012 season, and is currently represented by agents Don Nomura and Arn Tellem. He added confirmation of this posting on his blog. MLB teams had until 14 December 2011 to submit a blind posting bid, and the Hokkaido Nippon Ham Fighters had until the 20th of that month to announce whether the highest bid would be accepted or rejected. Their announcement of acceptance of the highest bid, from the Texas Rangers, was made on 19 December EST, at a reported $51.7 million. The Rangers then had 30 days to negotiate with Darvish, or he would return to Japan. On 18 January, the Texas Rangers signed Darvish to a $60M dollar contract for six years with a player option to void the last year, fifteen minutes prior to a 4:00pm CST deadline. Rangers CEO Nolan Ryan commented that Darvish had shown more control than he did at Darvish's age. Darvish's first start in the Majors came on 9 April against the Seattle Mariners in Texas. His first MLB strikeout was of Dustin Ackley on a 2–2 80 mph curveball; the first MLB hit that he allowed was a single into left field by Ichiro Suzuki on a 2–2 96 mph fastball. He threw for 5​2⁄3 innings, giving up 8 hits, 5 runs, and 4 walks, and striking out five, gaining his first MLB win in the process. When Alexi Ogando came to relieve him in the 6th, Darvish got a standing ovation from the crowd at Rangers Ballpark in Arlington. Darvish's first start away from Rangers Ballpark in Arlington came on 14 April against the Minnesota Twins at Target Field. He pitched for 5​2⁄3 innings, allowing 9 hits, 4 walks, and 2 runs (one of which was unearned), while collecting 4 strikeouts. Despite the Rangers winning the game, it was a no-decision for Darvish. Instead, teammate Robbie Ross picked up the win. On 24 April, in a game against the New York Yankees, Darvish pitched for 8​1⁄3 shutout innings, collecting 10 strikeouts, while allowing seven hits and two walks. He gave up a hit to Nick Swisher with one out in the 9th. Joe Nathan, the Rangers' closer, relieved him and induced a ground-ball double play to get the save and secure the third win for Darvish. As Nathan came in, Darvish received a deafening ovation from the crowd. This game also marked the seventh time in MLB history that the two starting pitchers were both Japanese, with Hiroki Kuroda on the mound for the Yankees. The game was also televised in Japan. On 30 April, Darvish gave up his first MLB home run to Edwin Encarnación of the Toronto Blue Jays, in a game that Texas won 4–1. Darvish improved to 4–0, striking out nine and giving up only one run. For his performances in April, Darvish was named the AL Rookie of the Month. Darvish went 4–0 with a 2.18 ERA and 33 strikeouts. His first loss didn't come until 6 May, against the Cleveland Indians. On 20 June, in an interleague game against the San Diego Padres at Petco Park, Darvish got his first career MLB hit. In his first at-bat, he hit a bat-shattering single into shallow right field. He did not get to run the bases however, as Ian Kinsler hit a line shot to the second baseman, and Darvish was tagged off of the bag to complete the double play. He went 1-for-3 for the game. On 5 July 2012, the MLB announced that Yu Darvish for the American League and David Freese for the National League were the final two players to make the 2012 MLB All-Star Game rosters. Darvish had 10 wins and five losses with a 3.59 ERA when the MLB announced him as an All-Star. However, Darvish didn't get a chance to pitch in the game, watching from the dugout as his team lost 8–0. On 2 April 2013, Darvish pitched a perfect game through eight 2/3 innings against the Houston Astros, before throwing a slider and giving up a single to Marwin González. He threw 111 pitches, striking out 14 and walking none. On 27 May, Darvish became the first player since Randy Johnson and Curt Schilling in 2002 to have 100 strikeouts by Memorial Day. On 10 July 2013, Darvish was placed on the 15-day DL due to a strained trapezius and was replaced on the All-Star roster by Matt Moore. On 12 August 2013, he pitched a no-hitter through seven 1/3 innings against the Houston Astros until giving up a home run to Carlos Corporán. Darvish struck out a career-high of 15 in that game and Texas won 2–1. By season's end, he compiled 277 strikeouts in just 209 2/3 innings. Additionally, was fourth in the American League in with a 2.83 ERA, behind Aníbal Sánchez, Hisashi Iwakuma, and Bartolo Colón. Despite a pedestrian 13–9 won-lost record, Darvish placed second in the Cy Young voting to the Detroit Tigers' Max Scherzer. On 6 July 2014 Yu Darvish was elected to play the 2014 MLB All-Star Game. Darvish entered the All Star Game in the third inning to retire all three batters. During Spring training, Darvish began to experience soreness in his right triceps. He underwent an MRI the following day, eventually to reveal that his right elbow had a torn UCL, preventing Darvish from participating for the entire 2015 baseball season. He underwent Tommy John surgery on 17 March 2015, performed by Dr. James Andrews. Darvish began the 2016 season on the 15-day disabled list in an effort to continue recovery from the Tommy John surgery he underwent in 2015. He returned on 28 May against the Pittsburgh Pirates, pitching 5 innings with 7 strikeouts and one run allowed on 3 hits as the Rangers went on to win 5–2. On 13 June 2016, he was placed on the 15-day disabled list due to neck and shoulder strains. On 24 August 2016, he hit his 1st career MLB home run in an away game against the Cincinnati Reds, the first home run by a Rangers pitcher since Bobby Witt in 1997. Throughout the entire 2017 season, Darvish was enshrouded in trade rumors as he only had one year left of team control and the Rangers fell further from playoff contention. On 23 July, the Rangers stated that Darvish would not be available for trade. However, two days later, the Rangers said that the team would be open to trading Darvish for the "right deal". On 26 July, Darvish pitched ​3 2⁄3 innings, giving up a career-high ten earned runs, the most ever by a Japanese pitcher in MLB history. On 31 July 2017, the Rangers traded Darvish to the Los Angeles Dodgers for prospects Willie Calhoun, A. J. Alexy and Brendon Davis. He was 4–3 with a 3.44 ERA in nine starts for the Dodgers. Overall in 2017, combined with both teams, Darvish made 31 total starts with a 10–12 record, 209 strikeouts, and a 3.86 ERA. In the post-season, he won his one start in the 2017 NLDS, allowing only one run in five innings against the Arizona Diamondbacks while striking out seven. He also pitched well in the 2017 NLCS against the Chicago Cubs, with one run in 6​1⁄3 innings with also seven strikeouts. However, in the 2017 World Series he failed to get out of the second inning in either of his two starts against the Houston Astros. He lost both games, including game seven, and allowed nine runs (eight earned) in 3​1⁄3 innings while failing to strike out a single batter. They were the shortest two starts of his career and he became the first starting pitcher since Art Ditmar in 1960 to have two starts of less than two innings in the World Series. Shortly after the World Series, an unnamed Astros player suggested that Darvish had been tipping his pitches. After the season, Darvish became a free agent for the first time in his career. On 13 February 2018, Darvish signed a six-year, $126 million contract with the Chicago Cubs. Darvish played his first game with the Cubs on 31 March 2018, against the Miami Marlins. He allowed 5 runs in 4.1 innings as the Cubs won 10–6 in 10 innings. On 7 May, Darvish was placed on the 10-day disabled list due to the flu. On 26 May, Darvish was again placed on the 10-day disabled list due to right triceps tendinitis. On 19 August 2018, Darvish began a rehab stint. While warming up before the second inning, Darvish summoned trainers and was removed from the game. An MRI revealed Darvish had a stress reaction on his right elbow as well as a triceps strain, ending his 2018 season, after only 8 games and 40 innings pitched. Named the ace of the Japanese national team by manager Senichi Hoshino in the 2008 Beijing Olympics, Darvish took the hill in Japan's first game of the preliminary round against Cuba on 13 August, but was charged with the loss after giving up four runs in 4 innings. The subpar outing caused Hoshino to lose faith in him and scratch Darvish from the semi-finals that he had penciled him in for, sending Darvish to the mound only in situations that would have no bearing on Japan's fate in the tournament. Darvish started the last game of the preliminary round against the United States on 20 August and was brought in to mop up after the U.S. had taken a decisive lead in the bronze medal match, finishing the tournament 0–1 with a 5.14 ERA (albeit with 10 strikeouts in seven innings pitched). Darvish pitched in the 2009 World Baseball Classic as the de facto ace of the Japanese national team, starting the opening game against China on 5 March. He pitched four innings, allowing one walk and no hits and striking out three as Japan beat China, 4–0. However, pitching in a Major League stadium for the first time in his career, he struggled in his second outing of the tournament against South Korea on 17 March, throwing five innings and giving up three runs (two earned) on four hits and a walk and ultimately being charged with the loss. His first career save would follow six days later, when he pitched the final inning of the semi-finals against the United States, yielding no runs and a single and striking out two as Japan won 9–4. Darvish came on in relief in the bottom of the ninth inning of the championship game against South Korea with Japan leading 3–2. He struck out his first batter, walked the next two, struck out his next, and then gave up a tying two-out single before finishing the inning with another strikeout. However, Japan scored two runs in the top of the tenth inning to regain a 5–3 lead, and after giving up a leadoff walk in the bottom of the inning, Darvish retired the next three batters (striking out two of them) to clinch Japan's second consecutive tournament title. In the WBC he finished at 2–1 with a 2.08 ERA and 20 strikeouts in 13 innings. He recorded a career-high 99 mph when he worked in relief at the WBC. Darvish, along with Ichiro Suzuki and Daisuke Matsuzaka, chose not to play in the 2013 World Baseball Classic. While the Japanese team advanced to the semi-finals, they lost to upstart Puerto Rico, 3–1, thus ending their two-time defending championship streak. Darvish is a right-handed pitcher who throws from a three-quarter arm slot in a drop-and-drive motion. He has a large frame for a pitcher, listed at 6 ft 5 in and 220 lb. Darvish throws a four-seam fastball which averages 93–95 mph (tops out at 99 mph), as well as a hard slurve (slider) in the low 80s with a sharp break. He complements these two with a wide repertoire of secondary pitches, including a two-seam fastball (also described as a shuuto), a cutter, two curveballs, a splitter, and an occasional changeup. Darvish has a "fast curve" and a "slow curve", the former averaging about 80 mph and the latter about 71. The slow curve is almost exclusively used in no-strike and 1-strike counts, while the fast curve is mostly used in 2-strike counts. Some professional scouts consider Darvish to have the best repertoire of quality pitches, including the best slider, in all of Major League Baseball. Advance scouting on Darvish is made difficult by his tendency to change his most frequent pitch sequences over time. While Darvish uses both the set, or "stretch" position and the windup, he has been noted for pitching exclusively from the stretch at times, even when there is no one on base. While pitching from the windup is generally thought to add velocity to pitches, the set position allows pitchers more control over baserunners. In Darvish's case the set position often is used as a way of keeping his delivery in sync and consistent. Prior to the 2006 season Darvish's "go-to" pitch was a screwball, and he tends to rely more on his off-speed pitches than his fastball. After injuring his shoulder in an exhibition game start against the 2006 World Baseball Classic Japanese national team in February 2006, because of the strain the screwball had gradually been putting on his shoulder, he took the pitch out of his in-game repertoire and worked to develop his splitter until it became an equally effective pitch that would replace the screwball. He also has succeeded in increasing his fastball velocity from year to year. In August 2007, Darvish acknowledged a relationship with Saeko. He announced later that Saeko was pregnant with their son. They married on 11 November 2007,  and their son was born in March 2008. Their second child, a boy, was born in February 2010. Darvish's divorce from Saeko was finalized on the same day that he officially signed with the Rangers. Darvish established a humanitarian fund dedicated to the construction, installation, and maintenance of wells, well pumps, and rainwater storage facilities in developing countries called the "Yu Darvish Water Fund" in February 2007. He has announced plans to contribute to this fund by donating 100,000 yen each time he notches a regular season win. The fund is managed by the Japan Water Forum. An entertainment company, Avex Group Holdings Inc. manages Darvish's non-baseball rights worldwide and Darvish has appeared in ads for many companies, including Seiko, Asahi Dry Black Beer and Pocari Sweat. Also, Darvish has appeared on the covers of Japanese men's fashion magazines, such as GQ, Men's Non-No, and Gainer. Darvish was selected as the "GQ Man of the Year" in the February 2012 Japan issue. On 30 July 2015, Darvish announced that his girlfriend, former world-champion wrestler Seiko Yamamoto, gave birth to their son on 29 July. Darvish resides in Evanston, Illinois. Darvish has caused controversy in his neighborhood with requests to construct a six-foot high fence around the property and to acquire adjacent land owned by the City of Evanston. The six-foot fence would require a zoning variance and would obstruct the lake views of neighbors. ^ "Darvish, young pitchers set to play vital role in WBC title defense". The Japan Times. 24 February 2009. Retrieved 4 November 2010. ^ "texas-rangers-acquire-rights-negotiate-japan-yu-darvish". ESPN. Retrieved 20 December 2011. ^ "An to Darvish" [An and Darvish] (in Japanese). Asahi Shimbun. Archived from the original on 29 November 2005. Retrieved 29 November 2005. ^ "Iranian pitcher wins Series-in Japan" (PDF). Pezhvak Newspaper. December 2006. Retrieved 4 November 2010. ^ "Iranian-Japanese High Schooler Darwish Making Impression". The Baseball Guru. 15 October 2002. Retrieved 4 November 2010. ^ "Tohoku High's Darvish hurls no-hitter at Koshien". The Japan Times. 27 March 2004. Retrieved 4 November 2010. ^ "Angels, Mets Seeking Some Iranian-Japanese Takeaway". The Baseball Guru. 19 January 2004. Retrieved 4 November 2010. ^ "Nippon Ham picks 18-year-old Darvish". The Japan Times. 18 November 2004. Retrieved 4 November 2010. ^ "Darvish faces school suspension over pachinko puffs". The Japan Times. 22 February 2005. Retrieved 4 November 2010. ^ "Darvish earns win in first pro start as Fighters down Carp". The Japan Times. 16 June 2005. Retrieved 4 November 2010. ^ "Young Nippon Ham hurler Darvish tipped to be top for a long time". The Japan Times. 13 October 2006. Retrieved 4 November 2010. ^ "Darvish, Naruse square off in marquee Game 5 matchup". The Japan Times. 18 October 2007. Retrieved 4 November 2010. ^ "Darvish fires Fighters to win". The Japan Times. 14 October 2007. Retrieved 4 November 2010. ^ "Fighters move to Japan Series". The Japan Times. 19 October 2007. Retrieved 4 November 2010. ^ "Darvish, Seguignol key Hammies' win". The Japan Times. 28 October 2007. Retrieved 4 November 2010. ^ "Dragons clinch Japan Series". The Japan Times. 2 November 2007. Retrieved 4 November 2010. ^ "Darvish receives prestigious accolade". The Japan Times. 30 October 2007. Retrieved 4 November 2010. ^ "Darvish decides on nationality". The Japan Times. 20 August 2007. Retrieved 4 November 2010. ^ "Darvish outshines Iwakuma". The Japan Times. 11 April 2008. Retrieved 4 November 2010. ^ "Buffs, Fighters ready for PL Climax Series showdown". The Japan Times. 11 October 2008. Retrieved 4 November 2010. ^ "Resilient Darvish shrugs off problems to justify top billing for Fighters". The Japan Times. 12 October 2008. Retrieved 4 November 2010. ^ "Versatile Darvish powers Fighters". The Japan Times. 19 October 2008. Retrieved 4 November 2010. ^ "Seabol, Carp beat Giants in opener". The Japan Times. 4 April 2009. Retrieved 4 November 2010. ^ "Clutch hitting ignites Dragons to win over Giants". The Japan Times. 25 April 2009. Retrieved 4 November 2010. ^ "Darvish youngest to reach Y300 million in salary – 10 December 2009". Japantoday.com. Archived from the original on 3 September 2012. Retrieved 4 November 2010. ^ "2010 Japan Pacific League". BaseballReference.com. Retrieved 9 December 2011. ^ Allen, Jim (21 March 2010). "Opening with a roar; Big hits help Lions' Wakui outduel Marines' Naruse to start PL season on winning note". The Daily Yomiuri. ^ a b Gibson, John (17 April 2010). "Punchless Fighters have mound of troubles". The Daily Yomiuri. p. 20. Retrieved 12 October 2013. ^ a b "NPB Tracker / data: Yu Darvish". Retrieved 9 December 2011. ^ a b Armstrong, Jim (9 June 2010). "Darvish values attention from major leagues". Associated Press Worldstream. Archived from the original on 14 October 2013. Retrieved 12 October 2013. ^ "2010 Japan Pacific League Pitching Leaders". BaseballReference.com. Retrieved 9 December 2011. ^ White, Paul (19 October 2010). "Japan's top pitching prospect Yu Darvish won't play in Majors in 2011". USA Today. Retrieved 9 December 2011. ^ Newman, Patrick (6 January 2011). "Darvish Signs for 2011". NPB TRACKER. ^ "OANDA Currency Converter". Retrieved 8 December 2011. ^ "Japan weighs sport's healing power". The Toronto Star. 25 March 2011. p. S3. ^ "Suzuki Ichiro & Darvish Yu donate to earthquake relief". TokyoHive. 19 March 2011. Retrieved 8 December 2011. ^ Allen, Jim (9 April 2011). "A season like no other; Teams try to get Japan back to normal in year of challenges". The Daily Yomiuri. Retrieved 12 October 2013. ^ "NPB Tracker / data". Retrieved 8 December 2011. ^ "Yu Darvish". Retrieved 8 December 2011. ^ a b "Eagles hurler Tanaka wins Sawamura Award". Japan Times. 15 November 2011. Retrieved 8 December 2011. ^ "CS: Saitama Seibu Lions 5 – Hokkaido Nippon Ham Fighters 2". Retrieved 8 December 2011. ^ White, Paul (28 November 2011). "Divorce may delay Yu Darvish's major league arrival". USA Today. Retrieved 8 December 2011. ^ Sullivan, T.R. (24 January 2012). "Back in Japan, Yu discusses lofty U.S. goal". MLB.com. Retrieved 26 January 2012. ^ Adams, Steve (8 December 2011). "Yu Darvish To Be Posted Tomorrow". Retrieved 8 December 2011. ^ Newman, Patrick (8 December 2011). "Darvish to be posted". Retrieved 8 December 2011. ^ "Texas Rangers win bid to negotiate with Yu Darvish". Los Angeles Times. 19 December 2011. Retrieved 20 December 2011. ^ Durrett, Richard (23 February 2012). "Texas Rangers CEO Nolan Ryan eager to see Yu Darvish take the mound". ESPN.com. Retrieved 19 September 2012. ^ Sullivan, T.R. (9 April 2012). "Seattle gets to Yu, but Texas flexes". MLB.com. Retrieved 19 September 2012. ^ "Texas Rangers – TeamReport". Chicago Tribune. Reuters. 14 July 2012. Retrieved 19 September 2012. ^ "Yu Darvish loses perfect game with two outs in 9th inning, Rangers beat overmatched Astros 7–0". Washington Post. 3 April 2012. Retrieved 3 April 2013. ^ "Yu Darvish throws eight 2/3 perfect innings in Houston". USA Today. 3 April 2012. Retrieved 3 April 2013. ^ "Yu Darvish Becomes First Pitcher Since 2002 to Reach 100 K's by Memorial Day". Bleacher Report. 27 May 2013. Retrieved 28 May 2013. ^ "Yu Darvish dominant in return; fastest to 500 Ks". USA Today. Associated Press. 6 April 2014. Retrieved 7 April 2014. ^ "Texas Rangers at Tampa Bay Rays". USA Today. 6 April 2014. Retrieved 7 April 2014. ^ Sullivan, Ted (6 April 2014). "Rangers right-hander Yu Darvish fastest starter to 500 Ks". MLB.com. Retrieved 7 April 2014. ^ "MLB rules Ortiz broke up Yu's no-hitter in seventh". ^ "Yu Darvish loses no-hitter in ninth inning". Associated Press. 9 May 2014. Retrieved 10 May 2014. ^ "Yu Darvish to miss 2015 season". ESPN. 13 March 2015. Retrieved 16 March 2015. ^ Mello, Igor. "Darvish undergoes Tommy John surgery, out for 2015 season". CBS Sports Fantasy News. Retrieved 17 March 2015. ^ Staff, RotoWire. "Darvish begins 2016 season on DL". www.cbssports.com/. CBS Sports. Retrieved 3 April 2016. ^ ywebb (24 July 2017). "Texas Rangers Are Not Interested in Trading Yu Darvish". Nolan Writin'. Retrieved 27 July 2017. ^ "Sources: Rangers ready to move ace Darvish". ESPN.com. Retrieved 27 July 2017. ^ "Rangers Yu Darvish sets MLB single-game record for most earned runs allowed by a Japanese pitcher". @SNstats. 26 July 2017. Retrieved 27 July 2017. ^ McCullough, Andy (31 July 2017). "Dodgers acquire pitcher Yu Darvish from Texas Rangers minutes before trade deadline". LAtimes.com. Retrieved 31 July 2017. ^ "2017 Los Angeles Dodgers Statistics". Baseball Reference. ^ "Yu Darvish Statistics & History". Baseball Reference. ^ Stephen, Eric (1 November 2017). "Yu Darvish, Dodgers fall short in Game 7". SB Nation. Retrieved 2 November 2017. ^ "Yu Darvish was tipping his pitches in the World Series". Yahoo.com. Retrieved 16 December 2017. ^ Adler, David (13 February 2018). "Cubs sign Darvish to 6-year deal". MLB.com. Retrieved 13 February 2018. ^ "Yu Darvish's Cubs debut: 5 runs in 4 1/3". MLB. Retrieved 31 March 2018. ^ "Yu Darvish goes on DL with illness". MLB. Retrieved 7 May 2018. ^ "Yu Darvish goes on DL again with right triceps tendinitis". MLB. Retrieved 26 May 2018. ^ Gonzales, Mark. "Cubs' Yu Darvish leaves rehab start after only 1 inning". Chicago Tribune. Retrieved 19 August 2018. ^ Muskat, Carrie. "Darvish done for '18 with elbow, triceps injuries". MLB.com. Retrieved 21 August 2018. ^ "Darvish poised for spotlight at Olympics". The Japan Times. 26 July 2008. Retrieved 4 November 2010. ^ "Japan loses to Cuba in baseball opener". The Japan Times. 14 August 2008. Retrieved 4 November 2010. ^ "Relaxed ace Darvish gets to grips with ball". The Japan Times. 5 March 2009. Retrieved 4 November 2010. ^ "World Baseball Classic: Japan vs. Korea — March 17, 2009 (Boxscore)". WorldBaseballClassic.com. Web.worldbaseballclassic.com. 17 March 2009. Retrieved 4 November 2010. ^ "Japan books spot in final". The Japan Times. 23 March 2009. Retrieved 4 November 2010. ^ "Japan rules baseball world again". The Japan Times. 25 March 2009. Retrieved 4 November 2010. ^ "2012 Texas Rangers Top 10 Prospects With Scouting Reports". baseballamerica.com. Retrieved 26 January 2014. ^ Hershiser, Orel (7 March 2009). "Japan's Darvish has all the tools to succeed". Sports.espn.go.com. Retrieved 4 November 2010. ^ T.R. Sullivan (4 June 2016). "Darvish displays competitive fire, wins again". MLB.com. Retrieved 16 July 2016. ^ a b c "Yu Darvish mows down hitters with stunning variety of pitches comparable to Pedro Martinez". Yahoo. 24 April 2013. Retrieved 24 April 2013. ^ "Texas Rangers teammates Yu Darvish and A.J. Pierzynski forming dynamic duo". Dallas Morning News. 24 April 2013. Archived from the original on 28 April 2013. Retrieved 24 April 2013. ^ "Young star Darvish impresses Dragons". The Japan Times. 29 October 2007. Retrieved 4 November 2010. ^ "Fukudome bats Japan past Cubs; Darvish impresses". The Japan Times. 14 March 2009. Retrieved 4 November 2010. ^ "Yu Darvish's Filthy "Shuuto" from Tuesday – What is this pitch?". Beyond the Box Score. SBNation.com. 27 April 2012. ^ "Brooks Baseball · Home of the PitchFX Tool – Player Card: Yu Darvish". Brooks Baseball. Retrieved 19 September 2012. ^ Apostoleris, Lucas (22 July 2012). "Darvish's curves". The Hardball Times. Retrieved 3 October 2012. ^ Brooks, Dan (5 October 2012). "Advance Scout: The Difficulty of Scouting Yu Darvish". Baseball Prospectus. Retrieved 5 October 2012. ^ a b Fraley, Gerry. "Darvish from the stretch not unusual". Dallas Morning News. Archived from the original on 12 March 2012. Retrieved 24 March 2012. ^ Howell, Timothy. "Yu Darvish: Full Analysis and Grades of Rangers Ace's First Spring Start". Bleacher Report. Retrieved 24 March 2012. ^ "Baseball player Darvish and actress Saeko have son". Japan Today. Archived from the original on 15 October 2008. Retrieved 4 November 2010. ^ "Cubs player Yu Darvish buys $4.55M Evanston home". Curbed Chicago. Retrieved 13 June 2018. ^ "Cubs pitcher seeks to buy public lakefront land | Evanston Now". 21 June 2018. Archived from the original on 21 June 2018. Retrieved 21 June 2018. Wikimedia Commons has media related to Yu Darvish.